Since 1946, Resene has forged a reputation of excellence and quality in manufacturing products designed to meet the demanding standards of architectural and building industry professionals and homeowners. Working hard to stay ahead of market trends, Resene has an international reputation as a leader in paint research and technology. Resene is renowned for its environmental friendliness.To reinforce this position we joined the Environmental Choice Programme in 1996. Resene’s commitment to this programme and our continuous development process to reduce the risk our products may present to our customers will ensure that safer, professional quality paint is available to everyone. When it comes to colour, paint is all about fashion. Colours come and go with changing trends. The Resene Total Colour System has all the colours, tools and resources you need to choose your colour scheme, including the unique The Range fashion fandeck showcasing the latest fashion colours. Sophisticated tinting technology enables Resene to produce durable colour options that remain true to colour long after they have been applied. Interlinked systems for decorative and high performance coatings means you can get the same spectrum of colours in a wide variety of products. To complement your paint choices, Resene also has an extensive range of wallpapers, decorating accessories and an exclusive range of curtains. Resene is proudly 100% NZ owned and operated and was named most Trusted Brand from 2012 to 2017 and Sustainable Business of the Year in 2010. 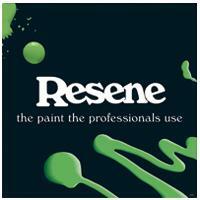 The Resene range is available from Resene ColorShops and selected resellers.